Look like another nail to the coffin. Too bad the movie is terrible! No upgrade would make me want to sit through that film again! Crappy film, but to be honest i thought the conversions of the Shrek films (they couldnt get the source renders) were pretty damn good for once. Good news ! Even if this “phantom menace” is clearly terrible, the pod-racers and “Duel of the fate” scenes could be cool. So since they got access to most CG assets, in his own words we can conclude that their conversion is equivalent to a “native” re-render with another camera. Back to the subject, it’s funny how this PR says that Prime Focus has been involved in Avatar although it was the case for only an handfull of shots, when in the same time the conversion they did in its entirety for Clash of the Titans is not even mentionned. Knowing this, I’m not expecting anything good from this Star Wars conversion. 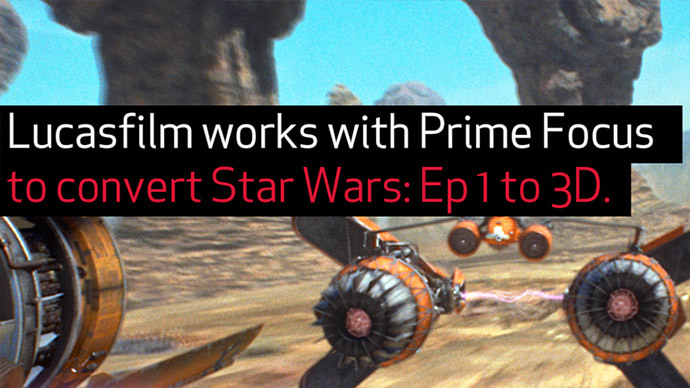 Prime Focus is also a VFX company, they are not only doing 2D to 3D conversions… I doubt that Lucas will be Ok with a level of conversion like with Clash of the Titans. Yes, but Prime Focus is in charge of the 2D-3D conversion here. And even if they may have improved their technique since Clash and Narnia – which I seriously doubt – I’m not exactly hopeful for that Star Wars conversion. It is not only up to the conversion technique, things greatly depend on the time and resources you have available for the conversion. If you have too few people and very short time frame, then the results will never be good… the time they had for the Clash of the Titans conversion was way too short for anything good as the decision for the conversion of the movie in 3D was taken very late… it wasn’t even shot with 3D in mind. CG animations do not need conversions they are simply rendered again using stereoscopic camera. But star wars was a composition job so the conversion will be crap as usual. If a viable technique existed to recreate 3D from 2D images – even given enough time and people – we would already know about it by now. Specialized researchers have been tackling this problem for more than 30 years, and they are only able to recreate 3D with an acceptable quality from hundreds of images of the same static scene. How can you expect that a little VFX company would be able to recreate 3D from an handful of shots of a moving scene ?